Wooden Folding Car Transporter is a beautiful truck with six rubber wheels and a removable trailer. This sturdy wooden transporter has a folding trailer which you can pull back so the four small included cars can drive up the ramp to the top level. This is a very well thought through toy which will give hours of fun as you load up your cars, drive off and deliver them. 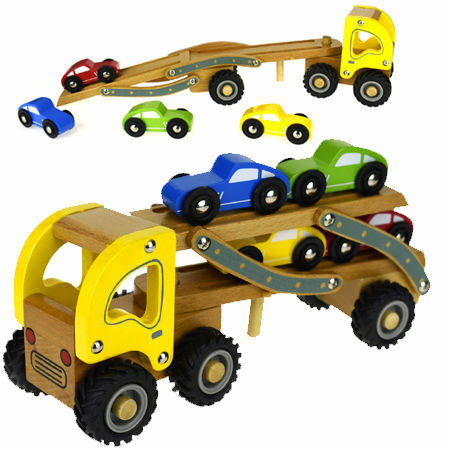 This transporter set comes with four wooden cars which are blue, green, red and yellow. Size: 28cm long x 9cm wide x 11cm high. Extended is 40cm. Cars 7cm. Material: Wood with Child safe paint. Rubber wheels. We like this because: "Well designed, sturdy and huge fun to load and unload."